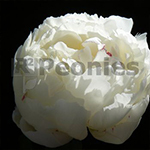 Snow Mountain is a beautiful white Peony with large flowers and large petals. With the light fragrance and the strong stems is the Snow Mountain one of the better cut flower Peonies. This variety has flowers up to 15 cm and dark foliage therefore it’s an eye catcher in your garden. Every year older gives the plant more flowers. Snow Mountain has an excellent use for cut flower raise as well for planting in gardens and city parks.